I don’t have to travel hundreds of miles to play golf badly. I can do that on my home course. On the other hand, when you’re on your annual spring golf trip with a bunch of good friends, somehow there’s just no sting to a few high-scoring rounds. Kevin Conlon invited me once again to join him, his three brothers, and the regular gang that accompanies them on a four-round sampling of the best that Sunset Beach, North Carolina has to offer. Sunset Beach is about three-quarters of the way from Wilmington to the city limits of Myrtle Beach, South Carolina. The area is part of Myrtle Beach’s Grand Strand. A picturesque old drawbridge provides the only link from the mainland to the barrier island oceanside community, across the Intercoastal Waterway and a wide expanse of marshland. Just west of the drawbridge is the 2,000 acre development of Sea Trail Resort & Golf Links (80 Mill Pond Road, 28468; 800-624-6601). Four golf courses meander through the property, along with hundreds of homesites of all kinds, from condo units to townhouses to single family residences. We stayed in a “golf villa” unit that overlooked one of the golf courses. For our first round we played the Oyster Bay Golf Links, near the Sea Trail property (800-697-8372). This Dan Maples design opened for play in 1983, and immediately earned Best New Resort Course honors from Golf Digest Magazine. Thankfully, the management has kept up their standards, as the course was in great condition. I wish I could say the same for how I played it. My only playing highlight was a 10 foot birdie on the 17th hole, an island green par-3 surrounded by oyster shells. Our second round kept us on the Sea Trail grounds, as we played the Rees Jones Course (800-546-5748). Water comes into play on eleven holes. With the high winds we experienced, several of us easily found the wet stuff. The wind was a real factor this year, which was unusual compared to our prior springs in the Myrtle Beach area. A minimum two-club wind often challenged us. The Jones Course traps were also inviting. On a few occasions, I liked being in them so much that I remained in the bunkers for two or more strokes each. Our third round took place at the Thistle Golf Club, one of the new courses in the area (800-571-6710). It’s a 27-hole layout designed by Tim Cate. The North/West course combination we played looked like a blend of a links course and a Florida-style open layout, with ponds and waste areas as the primary hazards. I came to truly hate waste areas, but it wasn’t the course’s fault. We played our last round at Tiger’s Eye Golf Links, part of the three-course complex at nearby Ocean Ridge Plantation (800-233-1801). This beautiful layout is also a Tim Cate design, and was noteworthy in a few respects. First, it had a surprising amount of elevation changes for a course so close to the Carolina coast. Second, the fairways ran hot. My usual 2-wood drives go about 215-220 yards at most, but at Tiger’s Eye I ripped several drives of 270-290 yards. I also proved the adage that no good drive goes unpunished. Playing badly didn’t really matter, of course. Sunset Beach’s pleasant surroundings, beautiful golf layouts, and the camaraderie provided by good friends more than made up for it. Two Cape Region golfers showed mid-season form in recent early spring play. On April 30, Patty Marvel made a hole-in-one with her 5-iron on the 140-yard par-3 sixth hole at Kings Creek Country Club, during an interclub tournament. Not to be outdone, her friend and neighbor Bernie Reid made a hole-in-one the very next day, at the 117-yard par-3 sixth hole at the Salt Pond golf course near Bethany Beach. Rehoboth Beach CC Head Professional Ron Barrows and his wife Jo were pleased at the results of the May 20 outing at Rehoboth Beach Country Club for the Delaware State Golf Association Scholarship Fund, featuring Senior PGA Tour star Dr. Gil Morgan. From just the day’s players and the Birdie Challenge pledges, the event raised well over $16,000. The money will be added to other funds donated by Toyota USA, Toyota dealers from across the country, and a special donation from DSGA tournament events throughout the year, to provide college scholarships. 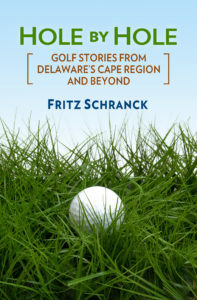 The announcement of this year’s recipients should take place at the Rehoboth Beach Junior Open, scheduled for June 10.